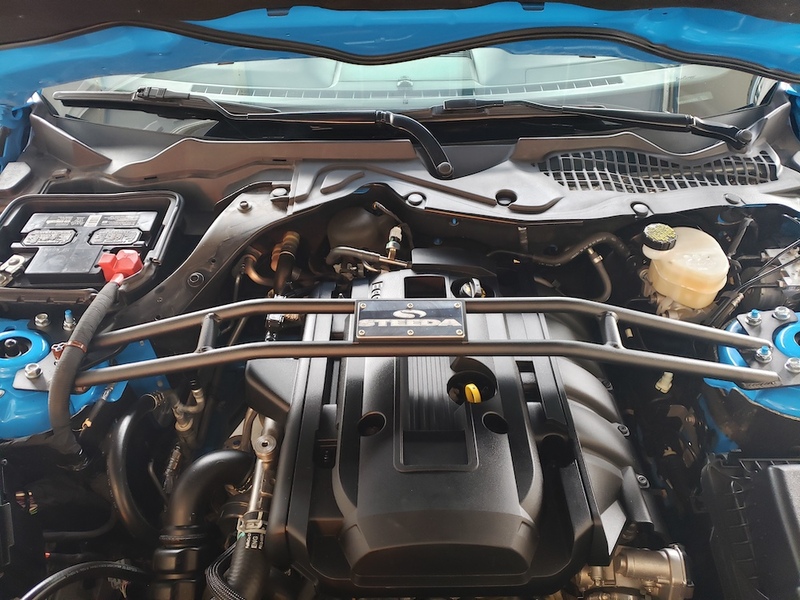 Steeda's S550 Double-Bar Strut Tower Brace is made specifically to work with your 2015-2019 and up Ford Mustang GT and EcoBoost (all models: Performance Pack, non-Performance Pack, 20" wheel option). Our S550 Steeda Strut Tower Brace for the 2015-2019 Mustang GT and EcoBoost is made from high-strength chrome-moly steel and powder coated wrinkle black. This easy-to-install bar will stiffen up the front end of your Mustang to improve vehicle handling. Please Note: Does not fit 2015-2019 Mustang V6. It fits all RH (right hand) drive models that are not V6. Purchase your Steeda S550 Strut Tower Brace for your 2015-2019 Mustang GT and EcoBoost at Steeda Autosports today! Simple fast install in under 20 minutes. First off very fast shipping, Quality was as expected from steeda for a powder coated part, install was simple, good instructions included. took maybe 20 min for install, and that was mostly looking for my sockets, this is easily a 10-15 minute job. I noticed the difference on my stock ecoboost taking corners faster. giving this product A+ for looks and easy install! 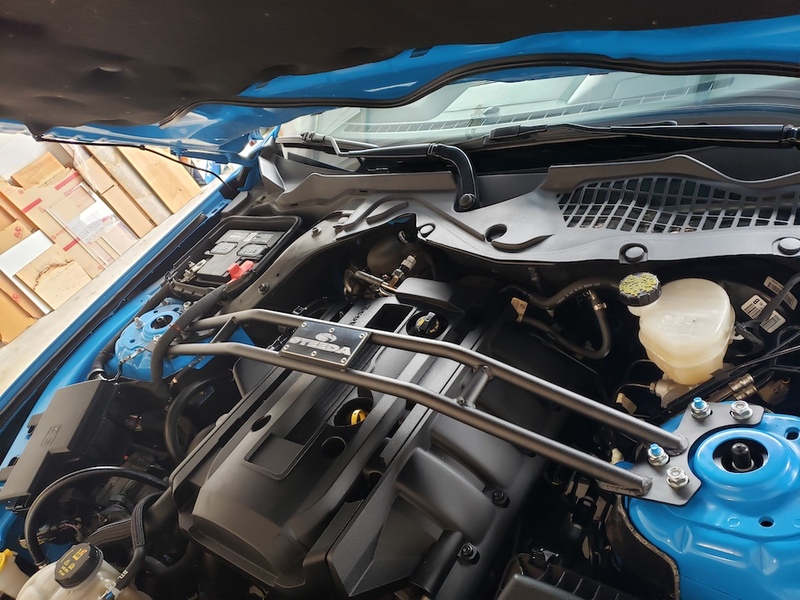 lets not forget to mention it fresh-ins up the look of your ecoboost engine compartment, people love seeing it at the shows. I already have the stage 1 handling package (progressive sport springs and sway bars) on my 2015 Ecoboost, and was amazed at the steering feel after this install. It's super responsive now and takes less effort to accomplish more when steering into curves at any speed. Doesn't hurt that it looks awesome, too! I have added the Steeda tower brace and extreme g-trac lower brace. I don't plan to autocross, but I do like to rush through a corner now and again. I noticed improvement in cornering FEEL. Whether this translates to faster cornering speed or not, I haven't checked. The best I can explain the change in feel - It's like upgrading your tires to a stiffer sidewall/lower profile. There is less chassis compliance and spongyness mid corner to confuse my brain that I'm close to the handling limit. Replaced my oem strut brace with the Steeda one, now that they have revised it to work with the performance package GTs! I also plastidipped the overlflow tank. Really cleans up the engine bay. I went with the Steeda version primarily because the design allows for easily removing the oil dipstick... I can just pull it straight up through the gaps between the bars without it touching anything. The Ford Racing (OEM) version is not as well thought out. Installed the new Steeda Strut Tower Brace that supports cars with the factory 20" option. Super easy installation. Best part is that the Steeda version allows easy access to the oil dipstick! Amazing product with super easy install that will blow your mind with the difference in rigidity in the corners I mean night and day!! If you didn't get the stock strut tower this is a must have!! It really brings the front end on cornering! !